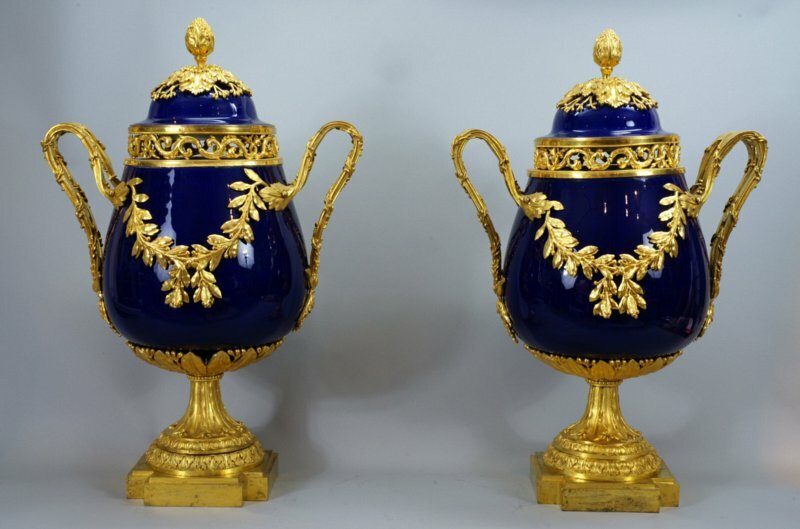 Rare pair of unusually large Sèvres beau bleu potpourri vases in superb early Louis XVI ormoulu mounts with original gilding and excellent chasing probably designed by Jean-Claude Duplessis. Each bulbous hard-paste vase piriforme à monter is evenly glazed in dark cobalt blue. The domed top is surmounted with a beaded acanthus knop framed by a large flat ring of acanthus leaves with four unusual separately cast groups of budded stems emanating from between the larger lobes. The top rests on a finely wrought reticulated band of ormoulu scrolls. The large double handles terminate in double acanthus motifs with budded vine stems below and budded vines enlacing the swelling handles above; the upper termination of the handles is in the form of acanthus from which issue beaded laurel garlands connecting the two handles. Each vase rests on a square base with cut out corners supporting a molded incurvated plinth under a large circle of laurel leaves that support the vase. Jean-Claude Duplessis was born in Turin, and became the Artistic Director at Vincennes in 1748 and served at Sèvres until his death in 1774. He created the wax models for porcelain and bronzes made at Sèvres. In 1758, he was appointed Orfèvre du Roi. A miniature painting of the Countess de Provence shows her seated in front of a fireplace where a similar large-scale mounted beau bleu Sèvres is placed. Many of these early mounted Sèvres monochromes were royal gifts.